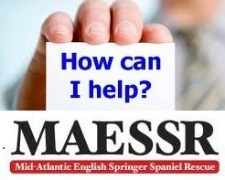 Vote for MAESSR every day! It is raining Springers this year and our foster homes are working hard to keep up with the demand. If you have ever considered trying fostering now is the time to give it a try. There is no greater reward than seeing a lost or unhappy pup find his way to a bright, healthy, tail wagging life under your care. Nor seeing the happiness on the faces of the forever family who's life will be enriched by him or her. Our foster families receive all the support they need to accomplish their goals. Foster families are responsible for the pups food. Just a few highlights, you can find more about volunteering under the catagories on our home page. Or better yet, come to one of our picnics or get-to-gathers left this year where you can meet foster families, volunteers and foster dogs to your hearts content. Hope to see you soon if only for a visit.